After centuries of intense whaling, to aid whale conservation efforts, scientists use photo surveillance systems to monitor ocean activity. They use the shape of whales’ tails and unique markings found in footage to identify what species of whale they’re analyzing and meticulously log whale pod dynamics and movements. 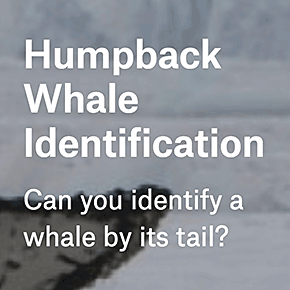 In this competition, the goal is to use Happywhale’s database of over 25,000 images, gathered from research institutions and public contributors to build an algorithm to identify individual whales in images. By contributing, you’ll help to open rich fields of understanding for marine mammal population dynamics around the globe. Note, this competition is similar in nature to this competition with an expanded and updated dataset. Happywhale is a platform that uses image process algorithms to let anyone submit their whale photo and have it automatically identified.